I have heard my mom say umpteen number of times that Kala Chana is much better (on our tummies) than the regular Chole Chana (Garbanzo beans). However, we all tend to use more of garbanzo beans in our kitchens. Don't we? I usually prepare Guggillu (recipe to be published shortly) using the Kala Chana. But after getting hooked to using cottage cheese in gravies, I am very impressed with the result. So I tried this Kala Chana Chole with a twist and used cottage cheese in the gravy which we all enjoyed. I like to pre-treat the kala chana like I do for the regular Chole Chana. In a sauce pan, add a tsp of oil and saute the finely chopped onions until golden brown. I like to make a paste of the sauteed onions, but that is totally optional. Make a paste of roasted peanuts, roasted sesame seeds, coconut powder, chopped tomatoes, green chillies, coriander leaves and keep it aside. (I grind the sauteed onions at this stage). In a heated sauce pan, add oil and the rest of the seasoning. After they are sauteed well, add the above paste and water too if required. Add the boiled kala chana , salt, mirchi powder, anardana powder and let it cook for about 8-10 min. 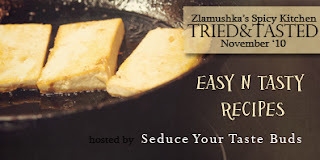 Make a paste of cottage cheese (Please note that cottage cheese is not the same as Indian Paneer as referred to in many places on the internet.) and add it to the gravy. Alternatively milk or cream can be used too. Adjust the taste and add garam masala if required. Garnish with chopped coriander leaves and serve hot with rice/roti and enjoy the protein packed gravy. I almost stopped buying jam for my son since he never really liked it and also I didn't want to invest in the artificially flavored so-called fruit jams for my family. So, when my MIL said she would show me how to make jam at home, I was more than happy to learn. I still remember my mom used to make different kinds of jams and jellies at home but it didn't really strike me that I could make it on my own. The natural flavors of the fruits especially that of Papaya made it very appealing. Added to this was that it was such a simple process. Boil all the cut fruits with very little water in a pressure cooker and grind the mixture (or mash them into a paste) when cool so there are no lumps. In a wide pan, boil sugar and water till it reaches one-string consistency. Add the fruit paste into the sugar syrup and stir slowly till it comes together into a thick mass. You could alternatively add just sugar into the fruit paste and boil them till it thickens instead of making a sugar syrup. Add the mixed fruit essence to get a nice flavor and if needed some color too. If you are not comfortable with adding the essence and the color, you could just skip this step. Cool the mixture and remove it into a glass container. Refrigerate it as you would do with any jam and enjoy! One afternoon, I hadn't planned anything for dinner and was skimming through the book 'Fast Foods Made Healthy' by Tarla Dalal. (I received this book as part of the gift from Nupur for my 'Jaangri' recipe). I saw this recipe and thought it would be a nice accompaniment to rotis. The most impressive thing for me in this recipe was the addition of pumpkin puree as part of the gravy. A couple changes to the original recipe and the Palak Tofu Koftas were just as delectable ! I substituted Paneer with Tofu and also Milk with Low Fat Cottage Cheese (Please note that the cottage cheese I am referring to here is not the same as Paneer as is referred to in many places). The only change I would make for the next time I make this curry is to make the koftas in a paniyaram (Ponganala penam) instead of steaming them. After steaming the koftas, they turned out very soft as opposed to being a little crispy when deep fried the conventional way. Divide the mixture into 15 equal parts. Shape each portion into even sized round. Steam the koftas for about 10-15 min. Keep them aside till required. (I placed these koftas in a button idli stand). In a heated sauce pan, add a little oil and saute the onions. Optionally saute the tomatoes too. Puree the sauteed onions and tomatoes. In the same sauce pan, add a little more oil and saute jeera, cloves, cinnamon, ginger-garlic paste and add the pureed onion-tomato mixture. Add the pumpkin puree and mix well. Add Chilli powder, sugar and salt and bring to a boil. Adjust the taste as needed. Make a paste of cottage cheese and blend it in the above gravy. Optionally milk can be added at this stage. Just before serving, reheat the gravy with a little water if needed and slide the steamed koftas into it and bring to a boil. We first tasted this Sooji Biryani about 3-4 years back at a friend's place and instantly fell in love with it. The traditional upma no longer figures on our menu card! This surely qualifies as a one-pot meal, quick breakfast or a light dinner. The other day we had this for dinner along with my sister's family and they too relished it. Though the look and feel is the same as the regular upma, the addition of spices makes a distinct difference and is sure to tickle your taste buds. In a heated Wok/Kadai/Sauce pan add oil and the rest of the seasoning in that order and let the mustard seeds crackle. Saute the chopped onions until golden brown. Add the chopped green chillies and mint leaves to the onions. Add the mixed veggies to the above mixture. (I like to boil the mixed veggies separately and reduce the cooking time). After the veggies are cooked, add the tomatoes and Sooji (Bombay rava/Semolina). Fry the Sooji for about 3-4 minutes until it mixes well with the veggies and changes to a nice golden color. Add 5 cups of water (or less if you like the biryani to be powdery; we like it a little soft) and add salt as per taste. Add garam masala and mix well so there are no lumps and let the water boil. Cover it with a lid and reduce the flame. The Sooji-Upma biryani style would bowl you over in 5 min! Don't forget to squeeze in the lemon juice in the end. Allam Pachadi is yet another favourite pickles of the Andhras. My MIL always leaves a stock of this pickle each time she visits us. We use this very frequently as a dip for idlis and dosas. Ginger has long been known for its medicinal properties and eating it in any form in moderate amounts is good. If stored in a refrigerator and it would last more than six months without losing its flavor. For ones who have a taste for spicy stuff, you could also serve it with steaming hot rice. Dry roast the Fenugreek seeds in a pan and then grind them when cool. Wash, peel and chop the ginger into manageable chunks and fry them in 1 tsp of oil till they lose their moisture or till they turn slight red. Remove aside and cool. Also, peel the garlic and fry them in the same pan for about a minute and remove it for cooling. Boil the tamarind in a microwave or in hot water with very little water in it. Add all the above to a grinder and grind it into a smooth paste without adding any water. Heat some oil in a small pan, add mustard seeds and hing and when the seeds splutter, pour it over the pickle. Serve it immediately with steaming rice or store it in an airtight container to be used later. Here I am finally with a cookie recipe! It has been a long time wish in my mind to bake a cookie. Undoubtedly it is a very satisfying experience to enjoy a home baked cookie with all natural ingredients. In some corner of my mind, I am always skeptical when I buy these baked goodies. The more I think on those lines, the more I feel I should recreate the same with healthier alternatives at home. I think this is one aspect which keeps me inspired to experiment. When I saw this recipe in Priya's blog, I was greatly impressed by the ingredients, most importantly the minimal usage of sugar. I tweaked it slightly by adding a few barley flakes. But these tasted heavenly. Barley Flakes can be omitted if not available. Date Syrup can be used instead of dates and honey. But the quantity needs to be adjusted accordingly. The next time I would increase the quantity of Whole wheat flour to 1 cup. Make a paste of the dates using sugar, applesauce and honey. In a mixing bowl add the oats, barley, wheat flour, coconut powder, baking powder and baking soda. Mix all the dry ingredients well. Make a well in the middle of the dry ingredients and pour the dates mixture. Mix gently to form a sticky dough. Preheat the oven to 350F. Prepare a cookie tray lined with foil. Gently make discs out of the dough and arrange them on the cookie tray giving enough space between each of them..
Bake them for about 20-25 min. Mine were ready in 22 min. Midway through, I covered the cookie tray with foil as I observed the tops were browning fast. Cool them and store them in air tight containers if they don't vanish within the hour! Sending these cookies to Tried And Tested Event hosted by PJ and initiated by Lakshmi and to Champa's Bake Off - Nov 19 2010. Tomato pickle is probably the most sought after pickles in Andhra households. And needless to say, each family has a different version of this. My MIL, who is an expert at making different kinds of pickles, was leaving for India after a long vacation. Since we wanted some fresh tomato pickle, who better to ask for! As always, she was more than willing to oblige. My only concern was the amount of oil she used for it but she says that is what keeps the pickle fresh for a longer period of time. When it was ready to be devoured, we threw all concerns into the air and enjoyed the richness of tomato with steaming hot rice and ghee. Heat about 3 tsps oil in a wide pan, add tomatoes and tamarind to it and let them cook well for a while. Meanwhile, dry roast Mustard and fenugreek seeds in another pan and grind them together when cool. When the mixture is reduced to a paste, remove it into a mixing bowl and add the ground powder, salt, mirchi powder and mix them well. Finally, heat oil in a pan, add mustard seeds, dry mirchi and some hing and let the seeds splutter. Pour this seasoning on top of the tomato pickle and mix well. Serve with rice and ghee and enjoy the heavenly taste of tomatoes. My sister, Jaya, who is currently visiting us, is a great supporter of honey. She always urges me to make some sweet using just honey and no artificial sweetener. I appreciate her idea of using just honey, but never got to make, up until now! I saw this recipe here and remember Jaya's nudges and so here it is..what greater opportunity than this when she is visiting us and gets to tastes the honey flavored kheer!! This is the first time I prepared kher with honey and was a little apprehensive but my fears proved unnecessary as this kheer was just so flavorful that we plan to make it fairly regular (S says whenever the bananas are over ripe this is the one to make!) So this aptly makes its way to Priya Mitharwal and Aipi's 'Bookmarked Event'. Blend the chopped dates and bananas into a smooth puree. Boil milk and add the banana-date puree. Bring it to a boil and check for the sweetness. Adjust as per need. Add honey if required. Garnish with chopped dates and honey. Relish this simple and quick dessert upon cooling! Note - I actually prepared this in the microwave but the stove top method would be just fine! For this month's edition of 'Indian Cooking Challenge', we have a very simple, yet a very difficult recipe here. I say simple because it is a different form of chikki we are used to eating since childhood and difficult because the consistency of the sugar syrup is the key to the recipe and that is kind of tricky, to say the least! This is apparently a typical Sindhi sweet usually made for Diwali. Thanks to Srivalli who has picked up a recipe from Simply Sindhi Recipes for this very interesting and delicious sweet we all enjoyed making and eating too!! Chop all the nuts and keep all the ingredients ready nearby and handy. Heat a sauce pan and add sugar and ghee and wait until the sugar melts and get a nice golden brown color. Add the chopped nuts, coconut powder, poppy seeds and cardamom powder. Make sure all the nuts are coated with the caramelized sugar. Immediately switch off the flame and transfer onto a greased surface and roll it thin with a rolling pin. Time is of essence here as the sugar syrup, upon cooling, would resist being rolled. With a greased knife, mark the shape and give it time to settle. (I had to refrigerate for a while). Upon cooling, break it into pieces and store in airtight containers. I think I wouldn't need this step as we would all finish it off in one sitting!! Multi-Grain Burfi is the sweet I tried and relished for Diwali. I had a plan in mind that I should try and make sweets as healthy as possible for the festival (Can sweets be healthy at all?? Good question..). So I tried this combination of grains. I feel that the ingredients can be altered based on the available ingredients. But the end product was a somewhat guilt free dessert that can be enjoyed by one and all. I had to keep some pieces extra careful (at the back of the refrigerator!!) for my sister who is visiting us after Diwali! Sweet lover as she is, she thoroughly enjoyed them !! Dry roast quinoa, barley flakes and rolled oats. Powder them upon cooling. Roast the coconut on low heat. Also roast the almonds and cashews and powder them upon cooling. In a heavy bottomed pan, add some ghee and fry the chick pea flour(Besan) until the raw smell changes to a nice aroma! To the nice smelling besan, add the powdered quinoa, barley flakes and rolled oats, grated and roasted coconut, powdered almonds and cashews. Gently mix them and add milk gradually to make a smooth batter. Let the mixture boil and thicken. Finally add the sugar and the remaining ghee while constantly stirring the mixture. The burfi is done when the whole thing comes together as a single mass without sticking to the edges. On a parchment paper lined plate (or a cookie sheet) or a greased plate, pat the mixture evenly and smoothen the top with a greased ladle. Gently cut into desired shape and store in an airtight container. Refrigerate for longer shelf life (upto a week if they last!). Sending these delicious Burfis to Priya's CWF - WG: Quinoa event. When Nithu asked us about our cooking experiences in the kitchen working together, we were excited that we would actually be with each other after a very long time and also be able to do a lot of cooking together. When my sister visited us, the first thing S asked her was to make tacos for him after he heard of the success stories back at her home. So, the very next day, he bought all the stuff necessary and patiently waited for the end product to be delivered on the table. We all fell in love with it instantly and we plan to make it a regular at home for dinner. The beauty of this is that it can be customized as per individual preference. Here is how we enjoyed..
Soak Rajma (red kidney beans) over nite and wash and pressure cook them. If you are anything like me, Pretreat the Rajma to avoid flatulence. In a heated sauce pan, get the rajma boiling and add the taco seasoning mix. Adjust salt and chilli powder as per taste. (Take care not to add salt to Rajma prior to this as the taco seasoning mix has a lot of salt already added!). Mix well so there are no lumps of the seasoning and mash the beans slightly so they get all mushy and let the mixture thicken. Chop all the veggies Lettuce, green bell pepper, red bell pepper, tomatoes, onion, and arrange them in different bowls. Also have grated cheese , Taco sauce , and sour cream handy. In a microwave safe bowl, spread the taco shells and nuke it for about 40 secs (so they become a little crispy). Take each taco shell, fill in with the rajma mixture, and then with all the veggies, layering them along with cheese, taco sauce and sour cream. Prepare each taco shell as per individual preference. I liked it when we mixed all the ingredients and quickly filled in the taco shells and gulped them down! Yet another successful experiment with Quinoa. Anyway, I can't take credit for this experiment as I read about Nippattu made with quinoa flour in Priya's blog. I just happen to use a different set of ingredients. These nippattus were very crispy and enjoyable and no one could trace the presence of quinoa. I am just amazed at how quinoa just blends into our Indian cuisine. A hot cup of tea/coffee for an evening snack - a perfect combo!! But we munched these crisps as and when we had a craving and finished them in less than 2 days!! I used very little mirchi powder and so the little one munched these heartily to our pleasant surprise! Soak the Moong dal in a glass of water for about an hour or so. (I soaked them in hot water for 20 min). Dry roast the quinoa and upon cooling, powder it. (Don't worry if the powder is not too fine..mine turned out to be a little grainy and didn't make any difference). Note - Quinoa flour can also be used if available. In a mixing bowl, add rice flour, powdered quinoa, soaked and drained moong dal, salt, mirchi powder and hot oil. Mix well until the oil is uniformly spread in the flour. Use water to make a dough a little at a time (read batch by batch). My mom says that if the flour is soaked for a long time, it would absorb more oil. Once the dough is prepared, heat oil in a frying pan. Take big marble sized dough and place in between oiled plastic sheets and press (I use the puri press/tortilla press) to make thin discs. Gently slide these discs into the hot oil and fry them on both sides until golden brown. Continue for the rest of the dough. I think I made these in 6-7 batches. Enjoy after they are cool. Store in airtight container. 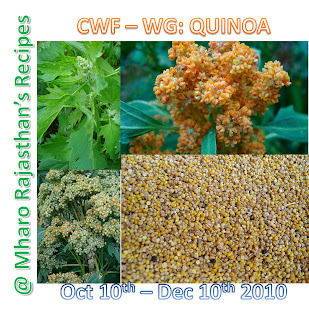 This surely makes an entry into the Bookmarked event by Priya and Aipi and also to Priya's CWF-WG:Quinoa event.